Truthfully Isaak's got sick yesterday with hives (which ended up being all over, and looked like the picture below), then it was followed up with some kind of stomach virus. It didn't last too long, but with the mixture of all that I called the doctor. Earlier this morning he looked so sick! He was curled up in a ball, and practically crying. My guess was that he got some kind of virus, which caused both the hives and stomach flu. Kid's bodies act so different from adults. 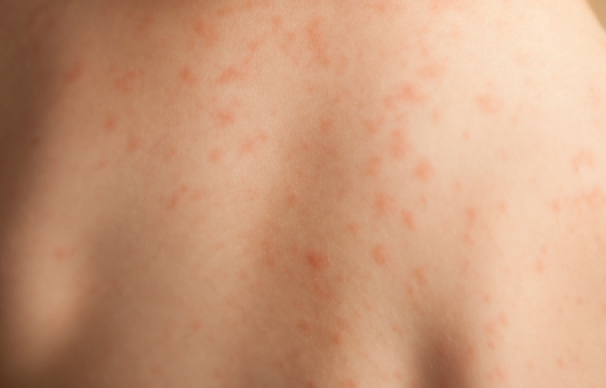 Kids can get hives from allergies to food, medicine, soaps, or lotions, from viruses, and from heat. He ate nothing out of the normal. That's why I thought he had a virus. It took until 10 AM for the doctors office to get back to me. When the nurse called she took the information I had already told them on the answering machine. I felt it was like a Déjà vu moment. Then the nurse was going to talk to the doc, and get back to me. By then Isaak was all better! He went from having cramps and crying to jumping and laughing. The doctor really said, "It sounds just like a virus. Keep him on the B.R.A.T. diet: Banana, Rice, Applesauce and Toast/Tea with probiotics in the mix. If he starts getting really thirsty give him Gatorade. Give him Benadryl if his hives get worse, or come back. Call back if he spikes a fever, or gets worse." All that I was doing anyhow. Except I gave him Jello juice instead of Gatorade. He's one happy camper now. It is such a relief when they feel better. I used to hate when my Daughter got sick,... you just sometimes have no idea what to do for them. Glad he is feeling better! I remember Allison broke out like that after a dose of amoxicillin (sp?) once. Thankfully benedryl cleared it right up too! glad that he's gotten better. is it the norm just to call the doc instead of going in? over in SG docs don't usually give "consultations" over the phone. they almost always ask us to come in. Poor little guy! Glad it was short-lived. Thank goodness he's feeling better. I can't believe that it too the doctor's office THAT long to get back to you. I would have called them back 10 mins after the office opened, LOL. Hurray, I'm glad he's better! Is Jello juice a brand of juice, or Jello that's not yet set? Are You Making Anything For St. Patty's Day?